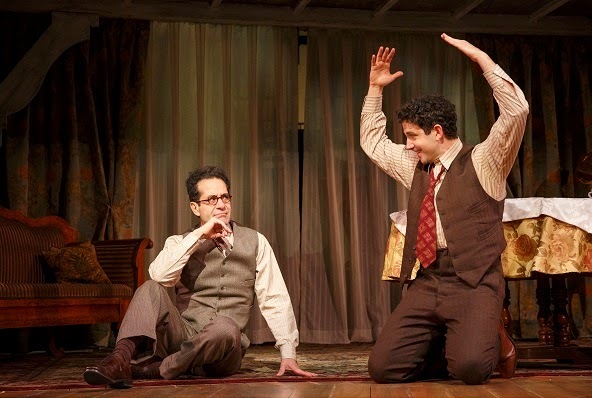 Let’s begin with "Act One"
Tony Shalhoub as Moss Hart, Andrea Martin as Aunt Kate and Santino Fontana as Moss Hart in LCT’s “Act One,” adapted by James Lapine from the memoir by Moss Hart. Photo by Joan Marcus. Each of us is the hero of our own story. In “Act One,” Moss Hart may have mythologized his ascent in the theater. Cut him some slack, his memoir has been an inspiration to generations of aspiring theater-folk. 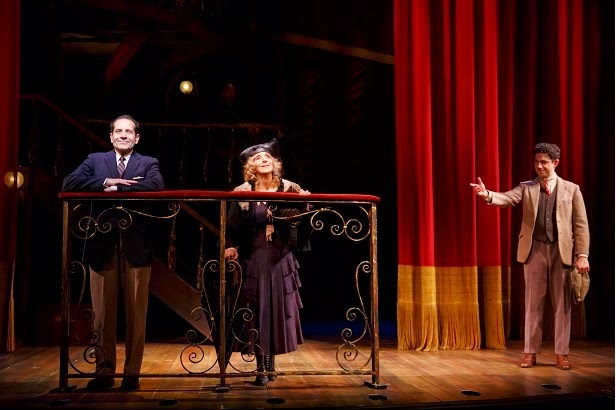 James Lapine, who also directs, has turned Hart’s book into a thoroughly theatrical event. Chuck Cooper as Max Siegel (one of several roles he undertakes) and Bob Stillman as Sam Harris (he also plays other parts) and Company in a scene from “Act One.” Photo by Joan Marcus. Hart’s first play, written in 1925, when Hart was just 21, to help fill Pitou’s road circuit, “The Beloved Bandit” flopped in Chicago. In the meantime, Hart was directing small theater companies all over the New York area, from the Borscht Belt to New Jersey. By 1930, “Once In A Lifetime,” co-written with George S. Kaufman (Shalhoub), and Hart’s first theatrical success, opened on Broadway, after many fits and starts out of town. Hart and Kaufman would continue to work together on many a show after this original collaboration. Andrea Martin– like Tony Shalhoub, who is a nominee as Best Leading Actor in a Play for his work here– adeptly handles three parts. She is Aunt Kate, eccentric theater producer Frieda Fishbein, and Kaufman’s wife Beatrice. Shalhoub and Martin each give distinct and nuanced lives to each of their characters. In this cast, you risk looking like a slouch if you only have one role to play. Santino Fontana does just that, and he’s outstanding as Hart at his youthful prime. “Act One” is a perfectly beautiful production. 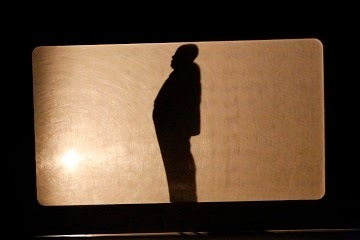 To learn more about “Act One,” please visit www.lct.org. 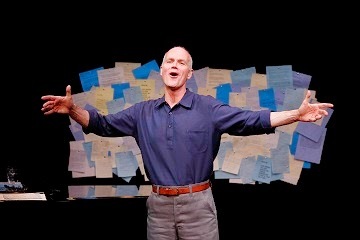 Simon Green in “Simon Green: So, This Then Is Life,” part of Brits Off Broadway at 59E59 Theaters. A performer with a middling voice and a fair amount of charisma, Simon Green offers his view of life at that tipping point of middle age. Pushing onto 57 seems to have made Mr. Green wax philosophical. 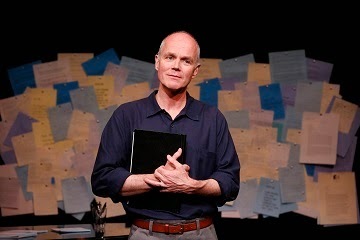 His “Simon Green: So, This Then Is Life,” in a US premiere at 59E59 Theaters through June 1, is a metaphysical cabaret, to piano accompaniment by Simon Green’s long time musical director, David Shrubsole. Mr. Shrubsole, co-creator with Simon Green for the program, has also provided the musical arrangements to songs by a wide range of composers from Noel Coward to Stephen Sondheim. For more information about “Simon Green: So, This Then Is Life,” please visit 59e59.org. Martin Miller in “The Lovesong Of Alfred J. Hitchcock,” part of Brits Off Broadway at 59E59 Theaters. Alma Reville had a lot to complain about it would seem. “Hitchcok,” the 2012 film starring Anthony Hopkins and Helen Mirren made it abundantly clear that he was obsessed with his leading ladies, and gruffly inattentive to his wife. “The Lovesong of Alfred J. Hitchcock,” David Rudkin’s radio play adapted by him for the stage, at 59E59 Theaters through May 25th, covers this ground anew. But, alas, despite the clever title, not afresh. 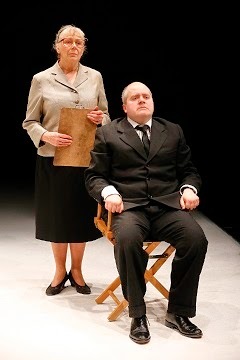 Roberta Kerr and Martin Miller in “The Lovesong Of Alfred J. Hitchcock,” part of Brits Off Broadway at 59E59 Theaters. Photo by Carol Rosegg. In fairness to David Rudkin, the 1993 radio play predates the film, and like it is based on Alma Reville’s memoire of life with Hitch. Reville, Mrs. Hitchcok, has provided the ultimate spoiler to the cheerfully eerie “Good evening” with which Hitchcock greeted his audience for the long-running TV mystery shows he hosted. For more information, and tickets, please visit 59e59.org. Kristen Bush, Michael Simpson and Jan Maxwell in a scene from “The City of Conversation,” a new play by Anthony Giardina, directed by Doug Hughes, at the Mitzi E. Newhouse Theater. Photo by Stephanie Berger. 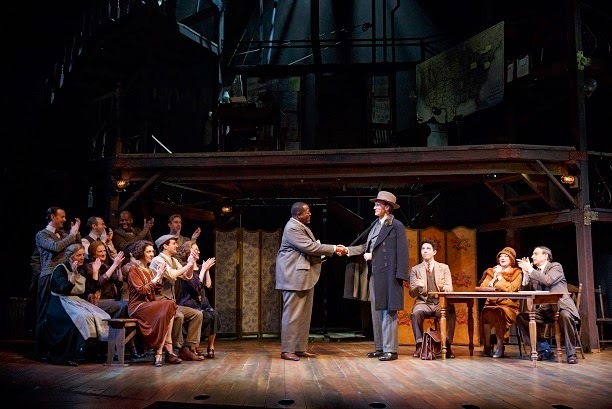 Our nation’s capital is the setting for Anthony Giardina’s new drama about politics and those who practice it, “City of Conversation,” at LCT’s Mitzi E. Newhouse Theater through June 22nd. 29th. 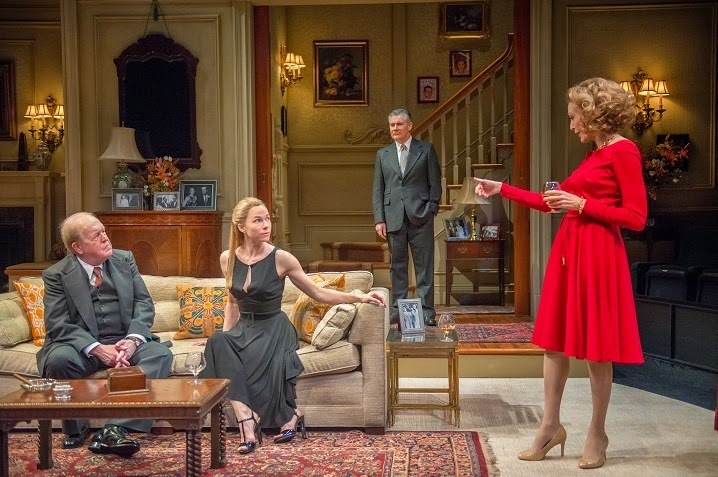 John Aylward, Kristen Bush, Kevin O’Rourke and Jan Maxwell in a scene from “The City of Conversation,” a new play by Anthony Giardina, directed by Doug Hughes, at the Mitzi E. Newhouse Theater. Photo by Stephanie Berger. 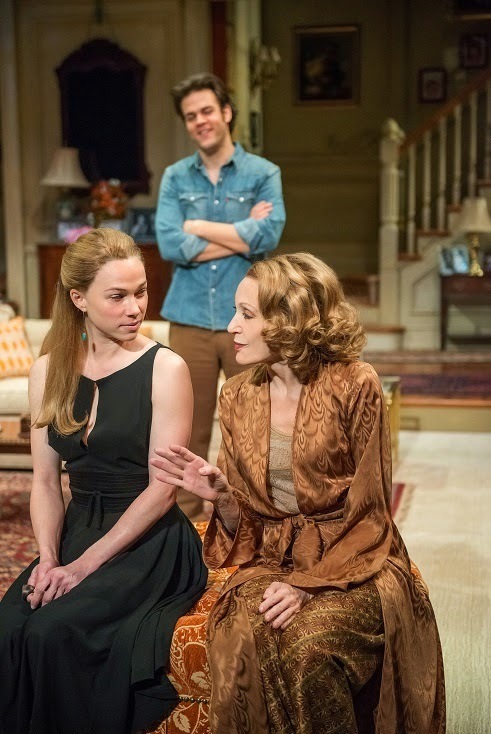 Actually “City of Conversation” is set in the Georgetown home of one of Washington’s movers, Hester Ferris (Jan Maxwell), a hostess with great liberal influence. Enter a young woman, Anna Fitzgerald (Kristen Bush) on the arm of Hester’s son Colin’s (Michael Simpson). She is, as Hester predicts, the rival she thinks she can easily vanquish. “I’ve seen this movie,” Hester tells Anna, referring to All About Eve. Luke Niehaus and Jan Maxwell in a scene from “The City of Conversation,” a new play by Anthony Giardina, directed by Doug Hughes, at the Mitzi E. Newhouse Theater. Photo by Stephanie Berger. Anna is in fact the new Washington. She is a Reagan Republican, and, along with Colin, plans to take America back for all the “real Americans” who have been ill-served by the regulations and legislation Democrats have enacted over the years. As political drams go this one, playing itself out from 1979 to 2009, is tightly plotted and fundamentally domestic. Michael Simpson, Phillip James Brannon and Beth Dixon in a scene from “The City of Conversation,” a new play by Anthony Giardina, directed by Doug Hughes, at the Mitzi E. Newhouse Theater. Photo by Stephanie Berger. Hester’s live-in lover, Senator Chandler Harris (Kevin O’Rourke) is at her side. Her sister Jean Swift (Beth Dixon) has her back. Colin and Anna come upon the scene as interlopers in the genteel world of Washington’s political wrangling. Rounding out the cast are John Aylward as Senator George Mallonee (R from Kentucky) and Barbara Garrick as his wife Carolyn, Luke Niehaus as Anna and Colin’s six year old son. 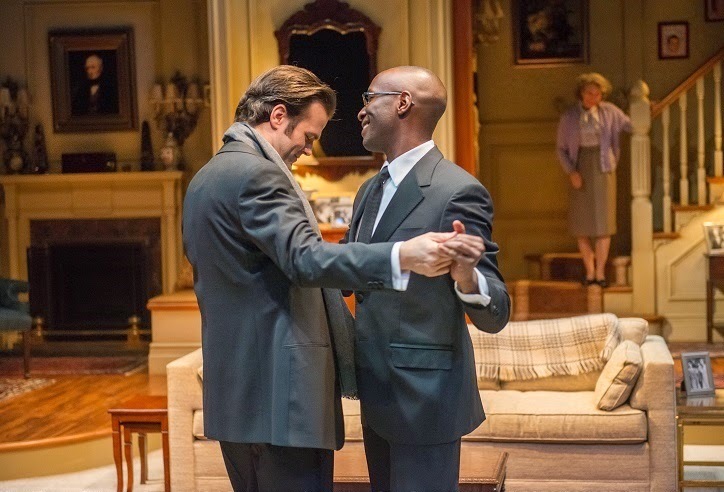 The ensemble under Doug Hughes’ direction is excellent with Phillip James Brannon as Donald Logan especially charming; Beth Dixon as the self-effacing Jean gives a very gratifying performance as well. Make no mistake, every member of the cast plays his and her part in giving “City of Conversaton” its sparkle. 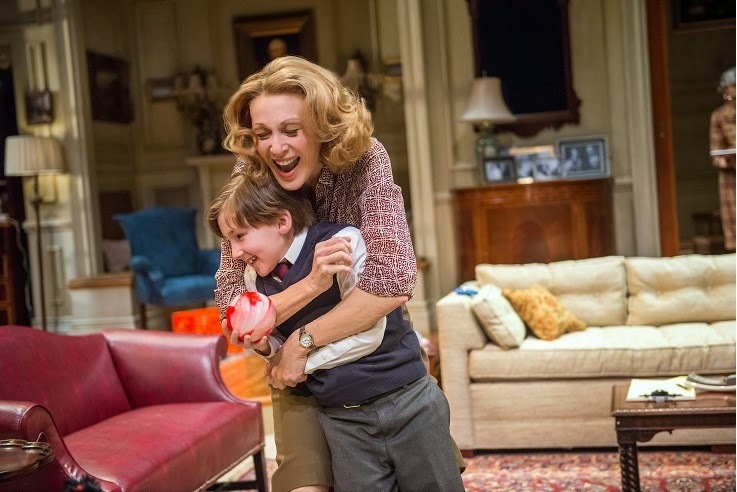 Jan Maxwell is, as always, superb. (Full disclosure, Maxwell is one of this reviewer’s personal favorites on any stage.) Her Hester is astute and composed, but she is not prepared for Anna’s ruthlessness. For more information on “City of Conversation,” please visit Lincoln Center Theater’s site. Trudi Jackson, Daisy Hughes, Alan Cox, and Mark Rice-Oxley in “Playing With Grown Ups,” part of Brits Off Broadway at 59E59 Theaters. Photo by Carol Rosegg. “I am woman, hear me roar,” the radio blares. In the background a baby wails in distress as only babies can. 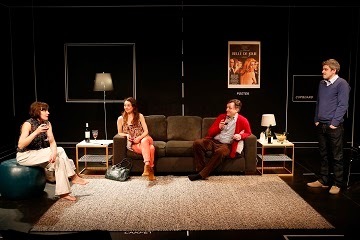 In Hannah Patterson’s drama, “Playing With Grown Ups.” at 59E59 Theaters through May 18th, the choices — have a family, enjoy a career– seem to be constricting. For Joanna (Trudi Jackson), at any rate, the ones she’s made are stifling. Her husband, Robert (Mark Rice-Oxley), pays lip service about wanting to be a care-at-home dad, while he’s wrapped up in his work. Robert has to worry about the possibility that as a film professor he may soon be redundant. Daisy Hughes and Trudi Jackson in “Playing With Grown Ups,” part of Brits Off Broadway at 59E59 Theaters. Even Jake (Alan Cox), Robert’s head of department and Joanna’s ex, is on edge. Jake’s seventeen year old pick up, Stella (Daisy Hughes) is the only one wise beyond her years, as she calmly observes the “grown ups” in mid life crisis. 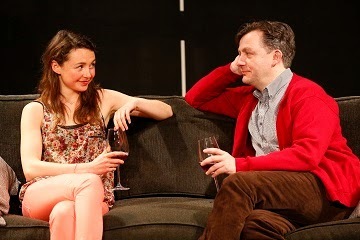 Mark Rice-Oxley and Trudi Jackson in “Playing With Grown Ups,” part of Brits Off Broadway at 59E59 Theaters. 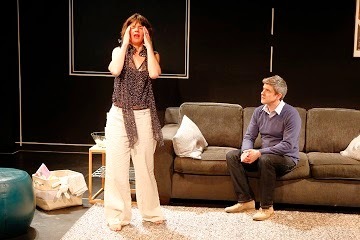 Daisy Hughes and Alan Cox in “Playing With Grown Ups,” part of Brits Off Broadway at 59E59 Theaters. Somewhere midway through, “Playing With Grown Ups” loses some steam, whether because of the script or the direction by Hannah Eidinow is unclear. It soon picks up plenty of emotion and energy as it draws to its inevitable conclusion. The acting is excellent. Not a misstep from any of them: Trudi Jackson’s steady meltdown; Mark Rice-Oxley’s cluelessness; Alan Cox’s detached bonhomie, and Daisy Hughes’ sweet knowing innocence are all spot on. To learn more about “Playing With Grown Ups,” please visit www.59e59.org.